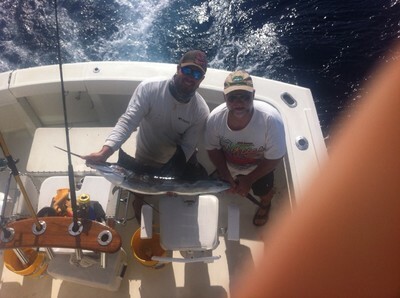 We had the pleasure of having Steve, Seth and Mathew the Marlin My Darlin. With all the wind lately the fishing has picked up somewhat and hopes were high as we headed offshore. As you have probably read here before offshore for Sailfish is about a mile off the beach. That is roughly 120 feet of water depth and we get there pretty quickly. The wind did give us a break today and backed off to the point that the medium kites could be used today as opposed to the heavy wind kites we have regularly been flying. Nice water color on the reef today and that is where we started fishing. Slight north current and scattered seaweed as we began the day on the edge. The Sails as you can see by the picture were smaller ones today but still lots of fun and all over the surface. A second Sailfish today was almost a twin of this one. The fishing will continue to have good and poor days as that is simply the way it often is right now. Good news in that the State of Florida has decided to allow the Vermillion Snapper season to remain open after their assessment that the base stock of fish is strong.